Fig. 1. 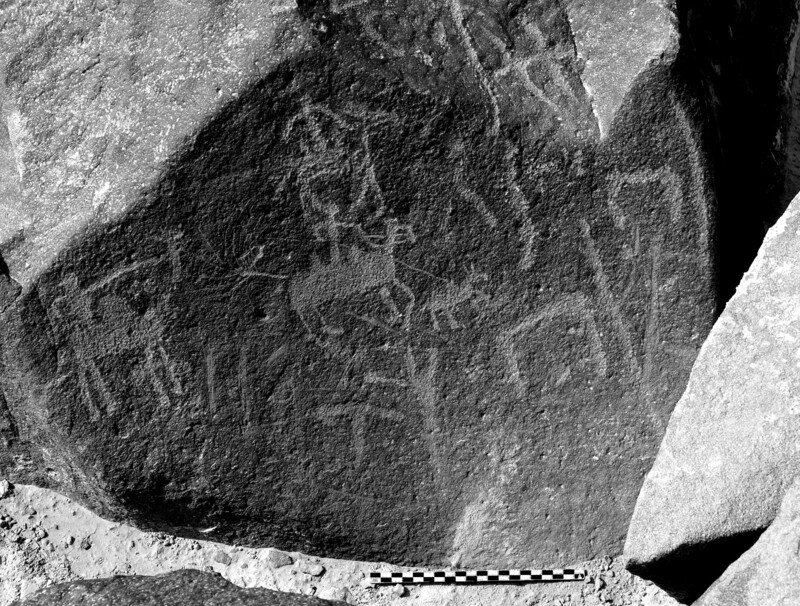 Safaitic rock art from Jabal Qurma (site QUR-2, RA184), showing hunters on horses and camels. Dated between the first century B.C.E. and the fourth century C.E. 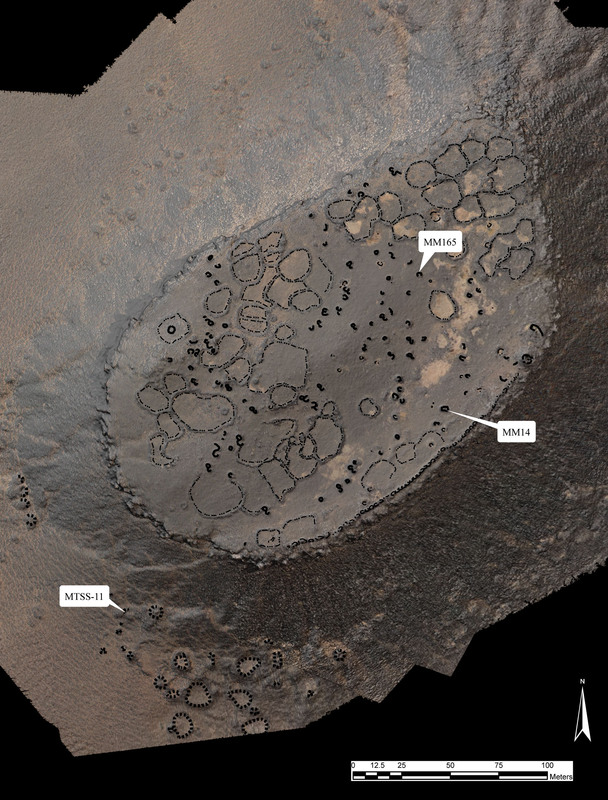 (courtesy Jabal Qurma Archaeological Landscape Project). Fig. 2. 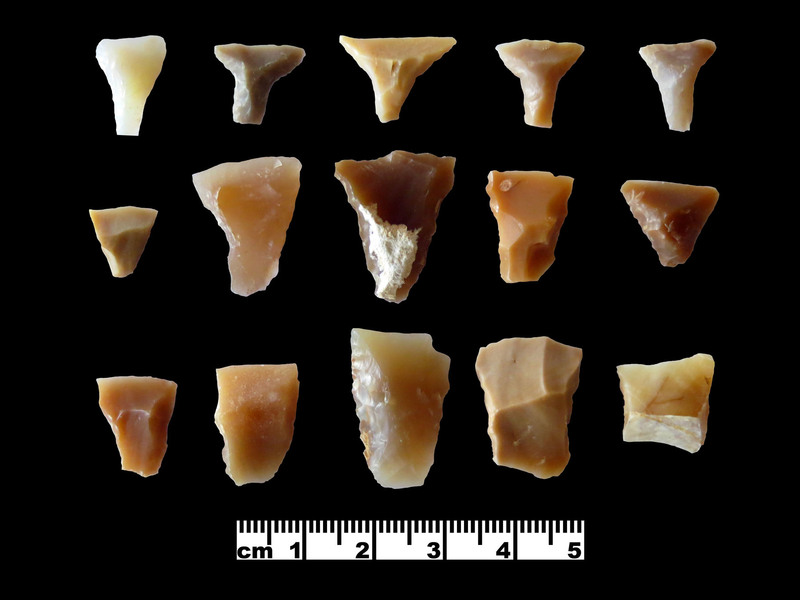 Transverse arrowheads from Wisad Pools (courtesy Eastern Badia Archaeological Project). Fig. 3. A photogrammetric contour map of Maitland's Mesa constructed from 12 oblique aerial photographs and converted to a digital elevation model. 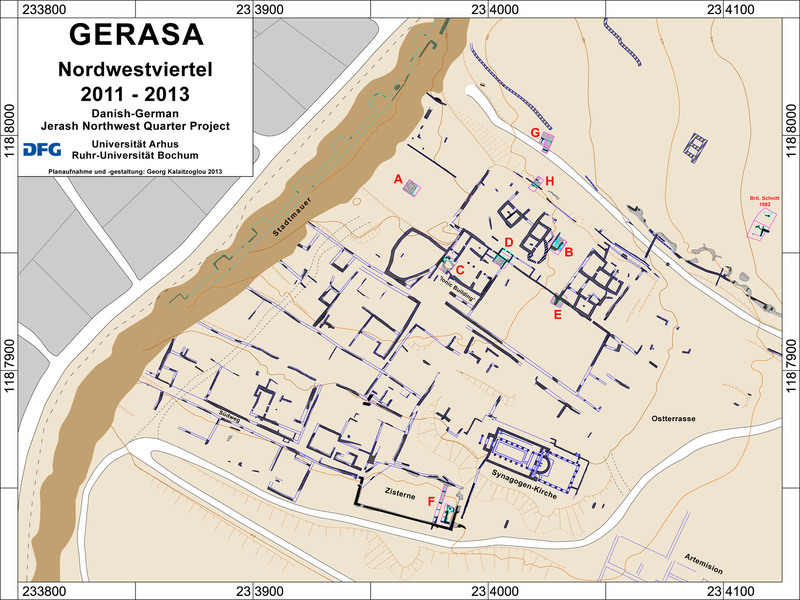 House 11 (SS-11) at lower left (courtesy Eastern Badia Archaeological Project). Fig. 4. 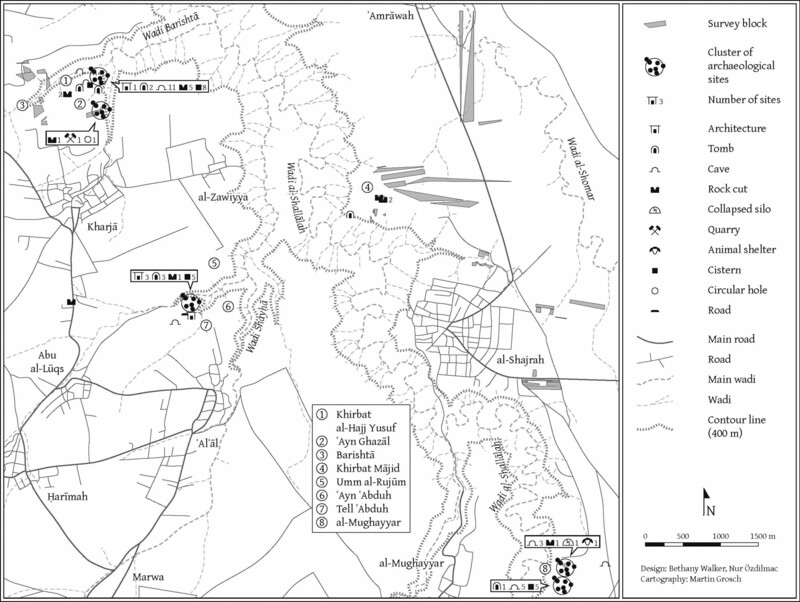 Azraq Marshes: A, the Greater Azraq Oases Area, of which the Druze and Shishan Marshes are a part; B, the Druze Marsh, with the locations of the Azraq Marshes Archaeological and Paleoecological Project (AMAPP) team's excavations (circles); C, the Shishan Marsh area, with locations of the AMAPP team's excavations (circles) and previous excavations (squares) (courtesy Azraq Marshes Archaeological and Paleoecological Project). Fig. 5. 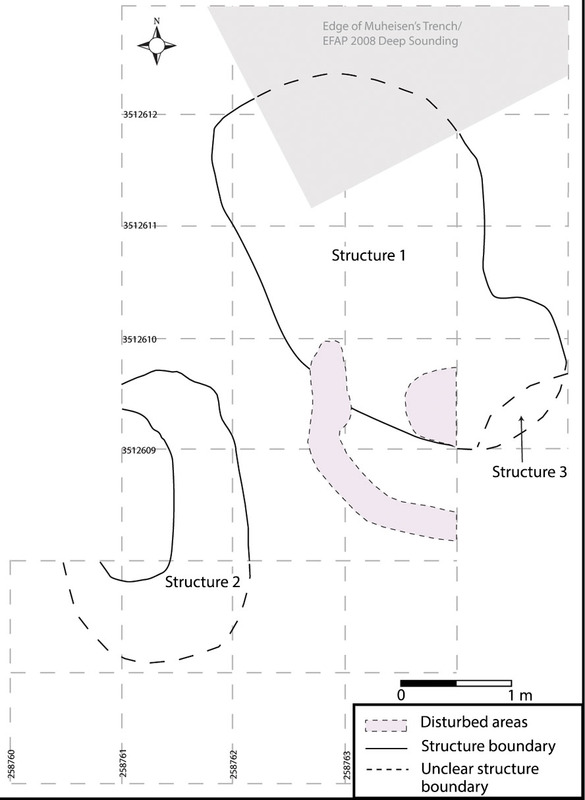 Plan of Structures 1–3 at Kharaneh IV, as drawn from the 2010 and 2013 excavation seasons (courtesy Kharaneh IV Excavation Project). Fig. 6. 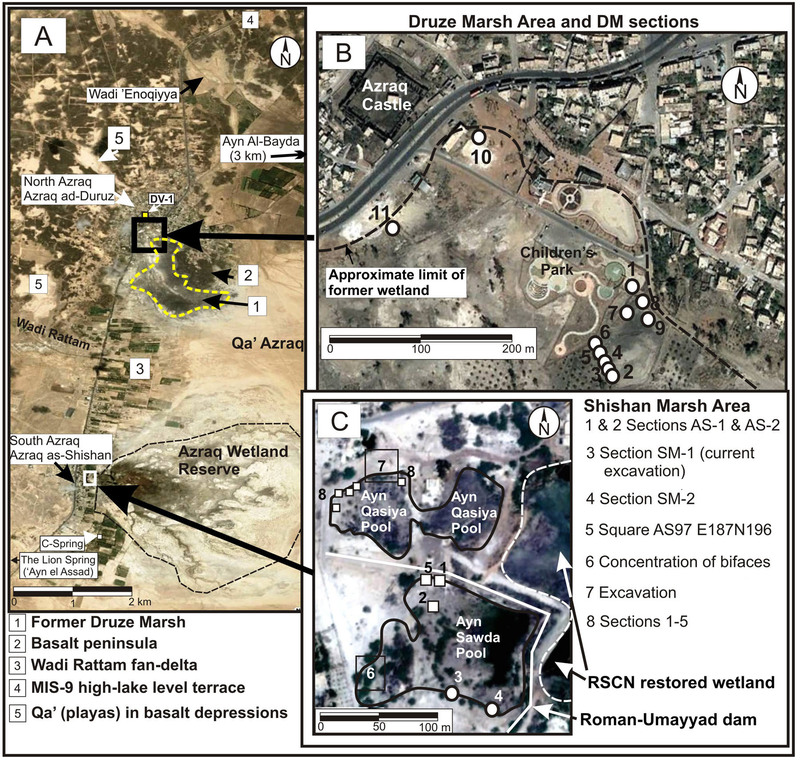 Map of the Northern Jordan Project's 2012 survey area (courtesy M. Grosch). Fig. 7. 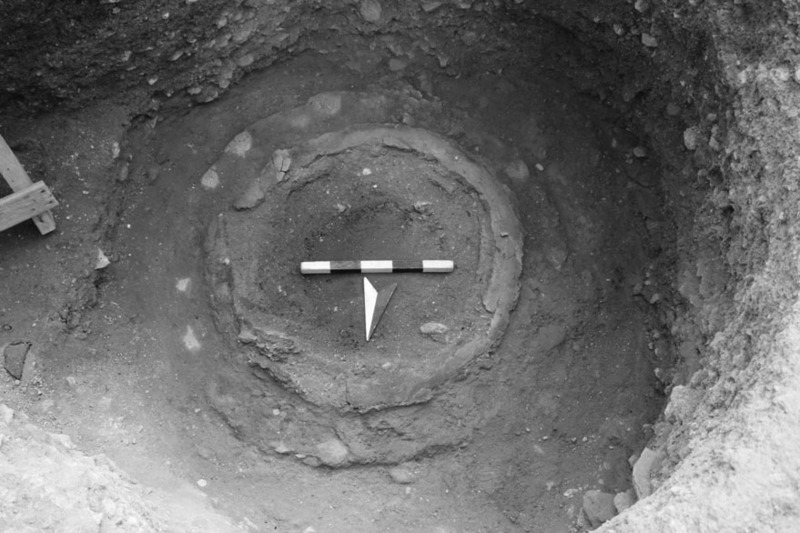 Pit in the Sanctuary of Zeus at Jarash where excavators found the ring-shaped remains of an in situ large circular mold for bronze casting (courtesy Jarash Sanctuary of Zeus Excavations). Fig. 8. 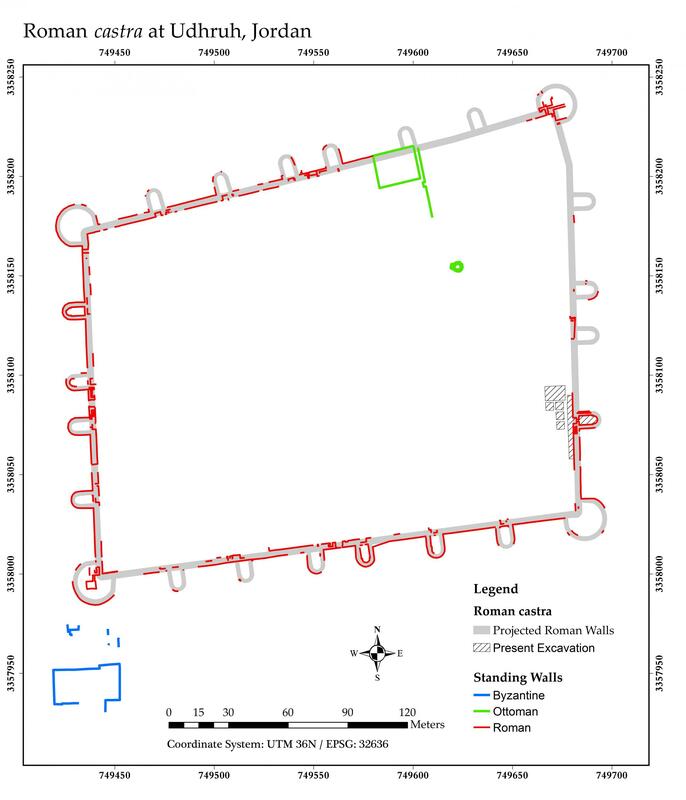 Survey plan of the northwest quarter of Jarash, with trenches (A–H) marked (courtesy Jarash Northwest Quarter Project). Fig. 9. 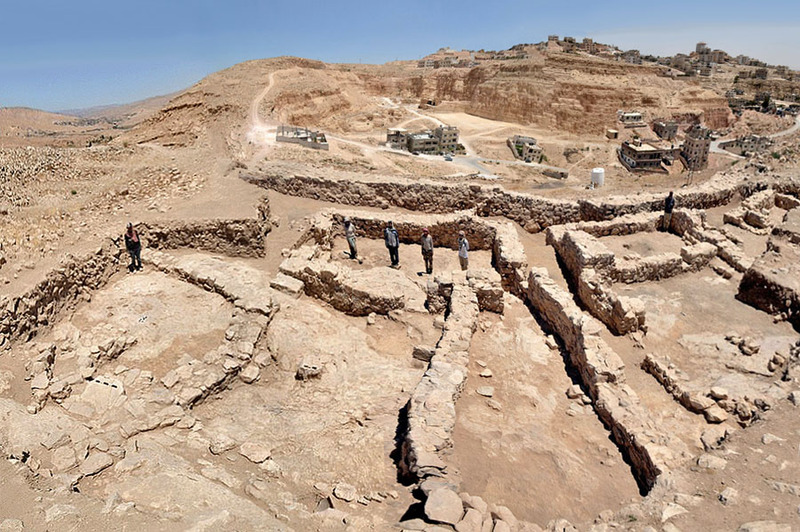 General view (from the south) of the Early Bronze (EB) IIIB Palace B at Khirbat al-Batrawy. 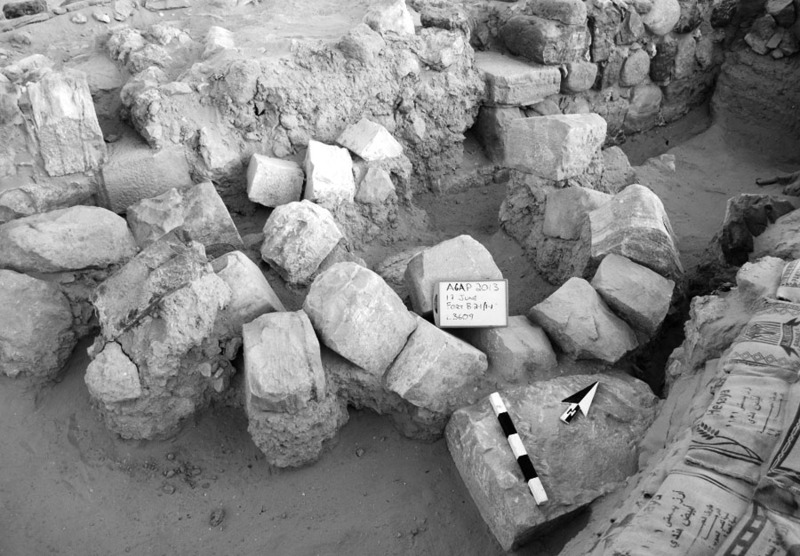 The palace was erected inside the EB II–III main inner-city wall (courtesy Khirbat al-Batrawy Excavations). Fig. 10. 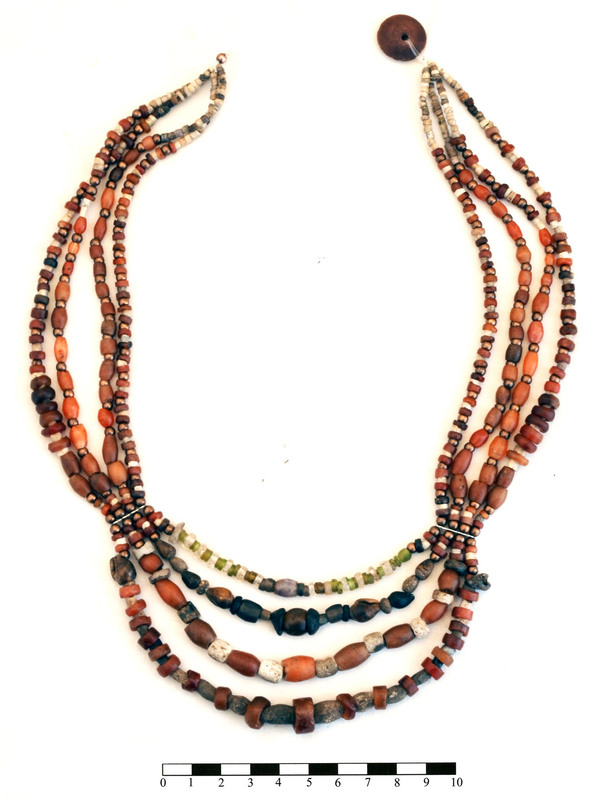 The restored necklace from the so-called Palace of the Copper Axes at Khirbat al-Batrawy, with beads made of amethyst, carnelian, olivine, rock crystal, quartz, bone, frit, seashell, and copper (courtesy Khirbat al-Batrawy Excavations). Fig. 11. 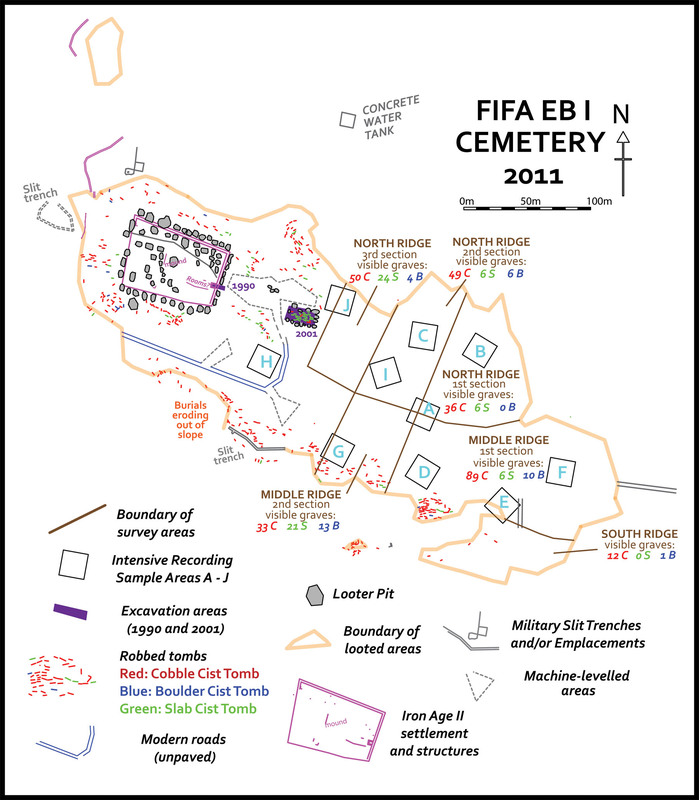 Comprehensive plan of Fifa (courtesy Follow the Pots Project). Fig. 12. 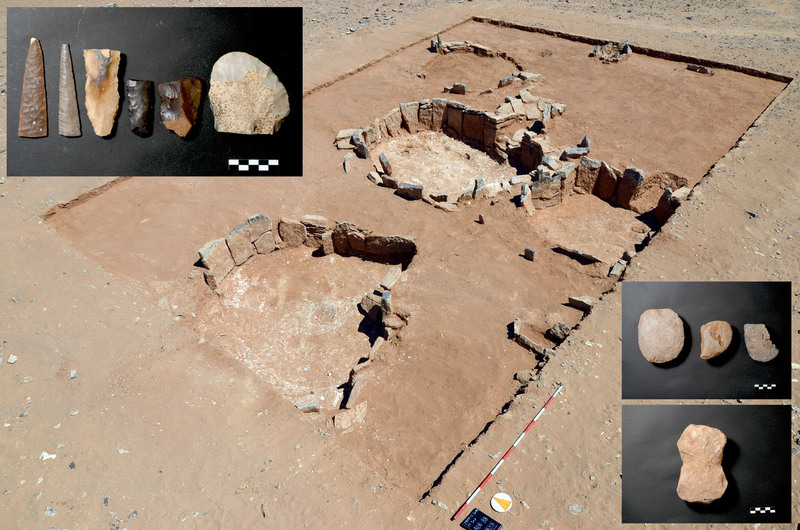 Structural complex and small finds from Hashm al-'Arfa 1 (courtesy Jafr Basin Project). Fig. 13. 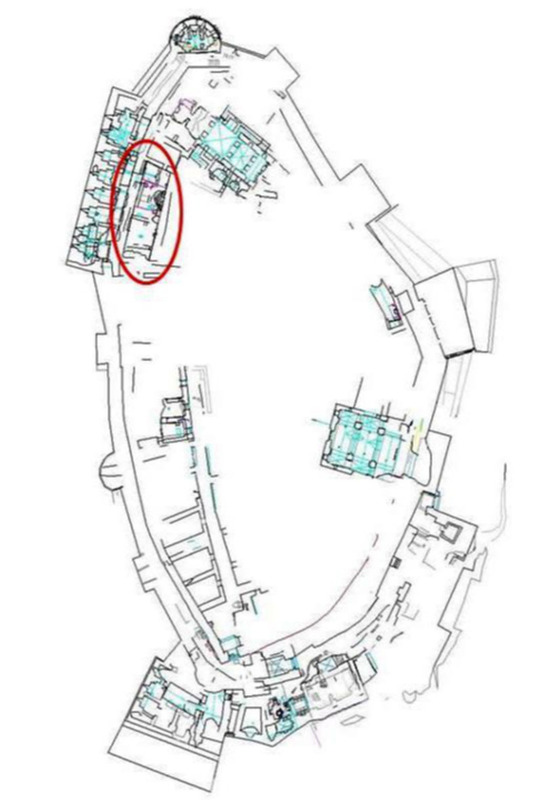 Plan of Shawbak castle site, with Area 35000 circled (courtesy Medieval Petra Project). Fig. 14. 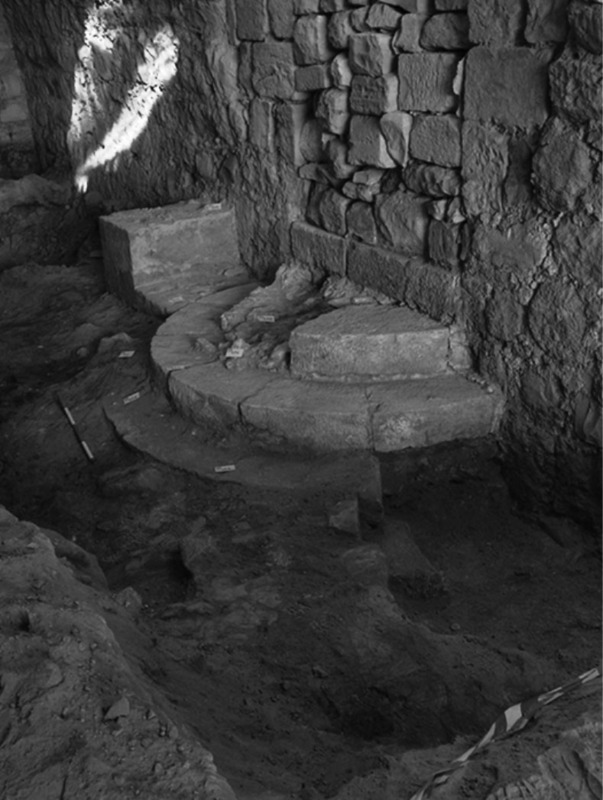 Ayyubid "monumental" staircase excavated in Area 35000 at Shawbak (courtesy Medieval Petra Project). Fig. 15. 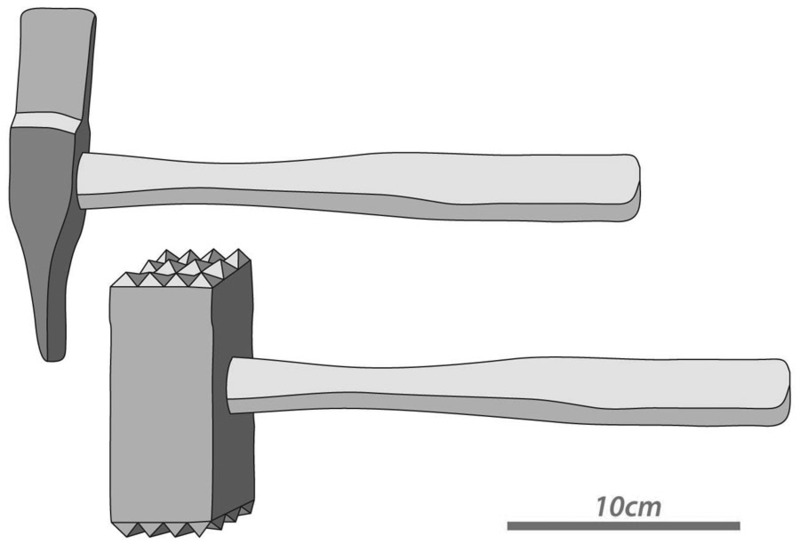 Examples of a stonemason's axe and bush hammer used in Nabataean/Roman Petra (courtesy T. Paradise). Fig. 16. 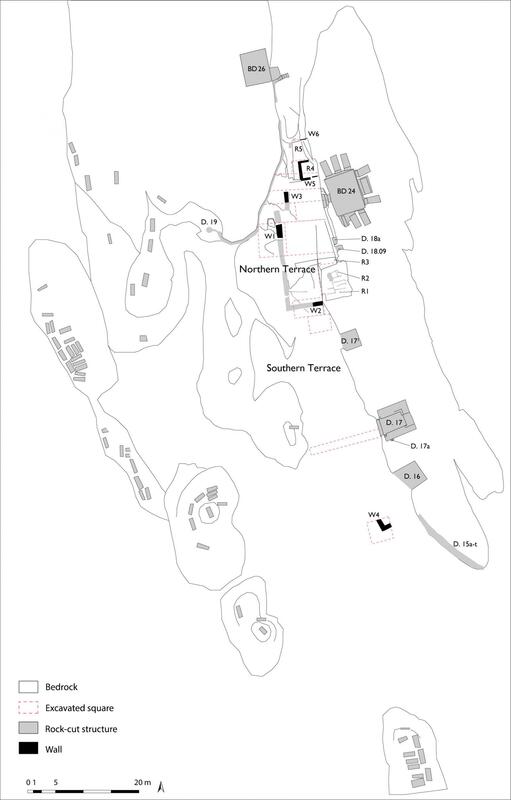 General plan of Aslah triclinium complex, showing the features of the Northern and Southern Terraces (courtesy International Aslah Project). Fig. 17. Roman castra (legionary fortress) at Udhruh (drawing by R. Emaus). Fig. 18. Collapsed archway of the gate of the Late Roman fort at 'Ayn Gharandal, with in situ inscription block (facedown) at lower right (courtesy 'Ayn Gharandal Archaeological Project). Fig. 19. 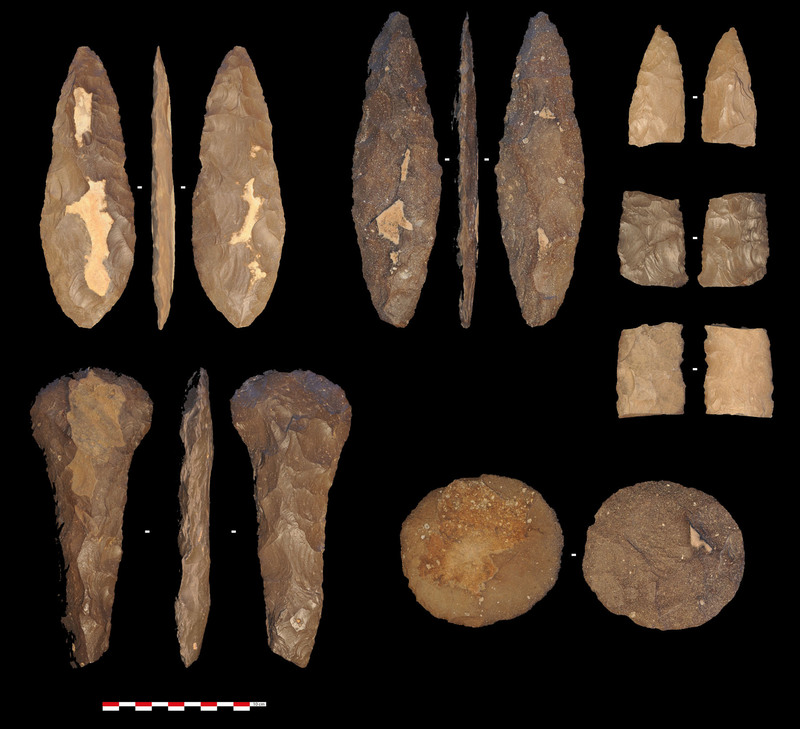 Bifacial tools recovered from a flint workshop in the area of Jibal al-Khashabiyeh (courtesy Southeastern Badia Archaeological Project).